Cake Submitted by Mallory D. from Goodyear, Arizona. This football cake was for a Chicago Bears fan. Bake two 13x9x2 cakes (the field) and two 6-inch round cakes (helmet). Frost the top of one of the 13x9x2 cakes and stack the other on top to form a double layer cake. Cut all 4 sides of the stacked 13x9x2 cakes so that the sides are straight, not curved. Frost the entire cake with your favorite frosting. Make sure that every inch of the cake is covered. Set aside. In a stand up mixer, coat the sides of the bowl and mixer attachment with vegetable shortening. Add 2 pounds of powder sugar and let stand. Now to make fondant: melt two 16-oz bags of marshmallows in the microwave on high for 3 minutes. Add green food coloring and mix with the marshmallows until fully green. Add marshmallows to mixer and mix on low until combined to a dough-like consistency. Grease hands and take mixture out of mixer and knead in 2 cups of powder sugar until firm. Cover work space with powder sugar and coat rolling pin. Roll out fondant enough to cover field cake, turning regularly to keep from sticking. Carefully lift fondant on to the field cake and smooth. Cut away excess. Now with buttercream icing make goal lines and numbers: 10,20,30,40,50,40,30,20,10 – 9 lines in all, 50 is the middle. Write the name of your favorite team in the end zone space on the side and the team logo in the middle. Helmet: Stack two 6-inch cakes on top of each other and then top with the ball half. (Don’t forget your filling in between.) On one side cut a straight line down for the front of the helmet. Now out of a cake board trace 5-inch circle, then cut out and wrap with foil. Frost top and add under bottom 6-inch as a base. Frost cake helmet with frosting in team colors. Place three dowel rods in the field cake, cut so that they are level with the top of the cake. Place the helmet cake on the dowel rods. Now take one more dowel rod and sharpen the end to a point. Then through the top of the helmet cake push down through the cake board base to the bottom and cut off the excess and cover hole with more buttercream. Make the team logo on the side of helmet with buttercream. Now with black pipe cleaners make the shape of the mask and add to the front of the helmet cake. (Made with another batch of fondant the same way as above but tinted in team colors.) Roll out on the work surface and cut into a t-shirt shape. For best results draw on a peace of paper and use it as a template. 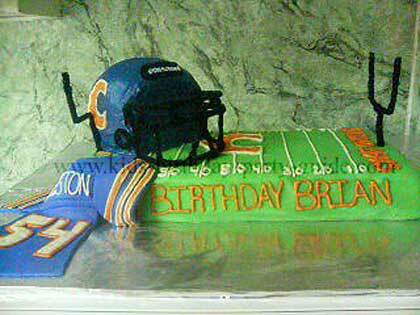 Now decorate the jersey as your favorite team’s, and lay next to your cake or on top. Finally, make goal posts out of pipe cleaners. Enjoy! For party ideas, be sure to visit our Football party page.